The #19051 Flip-Flat package includes the controller, motor arm, OTA bracket to center the lamp over OTA dew shields measuring 6" to 7-5/8" in diameter, a pair of industrial zip straps, USB cable, and software. Fully illuminated lamp is 6.7" (170mm) in diameter. 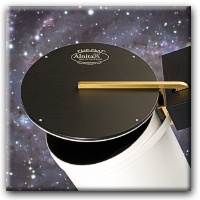 Alnitak Astrosystems' flagship product, the Flip-Flat, is a robotic lenscap and flat field illumination source for small to medium size refractors. With hundreds of Flip-Flats already in the field being used by satisfied customers, we’re confident that our product continues to meet the needs of discriminating astro-imagers around the world. The Flip-Flat employs advanced electroluminescent lamp panel technology to provide a uniform source of illumination for the production of high quality flat field frames necessary for serious astroimaging and photometric work. With the Flip-Flat, on-demand flat fields with uniformity errors less than 1% are now possible. In addition to providing excellent flat fields, the Flip-Flat protects the objective lens of the telescope from dust that typically plagues remote installations where the user cannot manually replace the lenscap after an imaging session. The Flip-Flat is easily mounted to the front of any telescope tube (or rigid dewshield) with an OTA outside diameter between 4" (100mm) and 8-1/8" (206mm). The Flip-Flat is attached to the telescope OTA with industrial nylon zip straps and easily removable for transport and storage. A simple Windows interface provides the ability to open and close the Flip-Flat and turn on the light source. The intensity of the light can be adjusted to one of 255 levels. IMPORTANT: Note that the diameter of the fully illuminated lamp for each of the Flip-Flat models is 6.7" or 170mm, regardless of the model purchased. To accomodate the smaller 4" to 6" OTA's, we add a spacer to the mounting bracket which better centers the lamp over the OTA. For the larger OTA, the bracket is machined down and an oversized ring is added to block any stray light from interferring with the flat lamp. Alnitak Software Compatiblity: Windows XP, Vista, Windows 7 and 8.